Violence is not a way to solve anything but it seems certain personality types prefer it. Read about the worst of it here with American Narcissism And Mass Shooters here. I’m missing my long lost dog something terrible today and I found one who at least made me laugh. Check out Tough To Handle Those Ears for cuteness overload. Birthdays are great when you’re a child. But when you’re an adult, sometimes we don’t want too much attention drawn to being another year older. 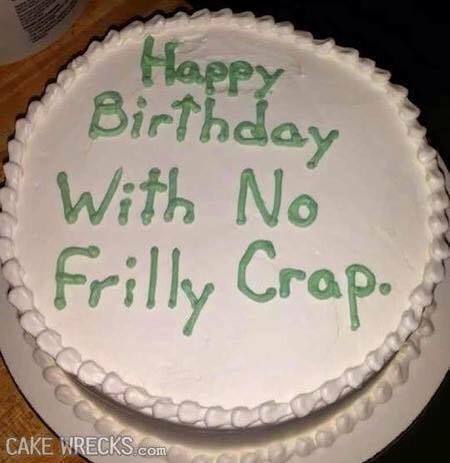 Check out the perfect cake for a No Frills Birthday. The only thing more funny than a fart joke is a fart meme. And in this rowdy, testosterone filled house, Fart Memes make us laugh until we fart. Cheers to that!